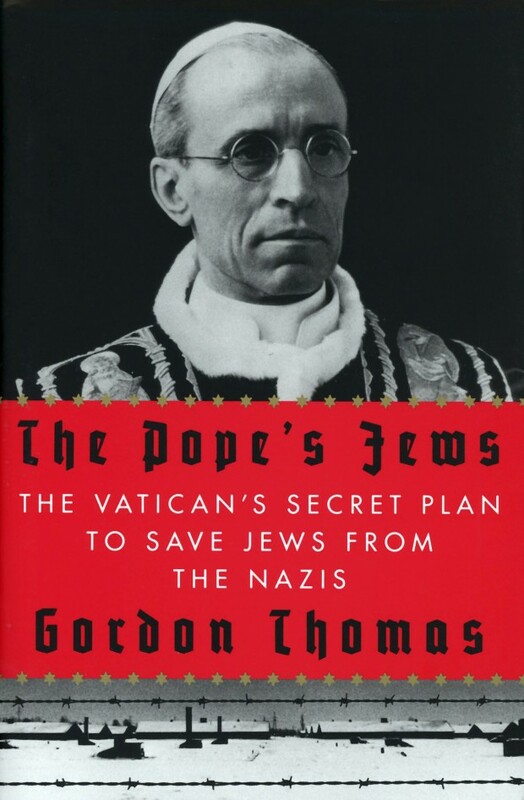 “The Pope’s Jews: The Vatican’s Secret Plan to Save the Jews from the Nazis” by Gordon Thomas. Thomas Dunne Books (New York, 2012). 336 pp., $27.99. In this book, he relies on personal interviews with Catholics and Jews who lived in Rome during World War II and the archival sources of diplomats, especially the British and Americans who lived in the Vatican during that period. This gives Thomas interesting perspectives on the day-to-day life of those in Rome under Mussolini, Italian fascism and German occupation. He is able to place the specific decisions made by Pope Pius XII and Vatican officials with regard to harboring Jews into the larger context of the Italian Resistance to the Germans and efforts by Allied diplomats and Vatican representatives to give refuge to Allied soldiers fleeing capture by the Germans. The result is a highly readable, and often riveting, book that gives a very good sense not only of the difficulties faced by the Catholics in saving their fellow Jewish Italian citizens but in surviving the daily obstacles of finding food for themselves. For this book, Thomas relied on a network of “researchers” from the current Jewish community of Rome and in Israel, some of them close relatives of the people whose lives he narrates in the book, as well as in the United Kingdom and the United States. He is thus able to draw on memories, memoirs and diaries, some for the first time, in sketching the portraits of those involved, including Pope Pius XII. Thomas describes the actions of the spies of various countries, including the plot by some in Germany to kill Hitler and Hitler’s plot to kidnap the pope, and the awareness of and reactions to these by the Vatican. He describes the “secret network” of British spies and Catholic priests who worked with the Vatican to bring to safety within the Vatican and Castel Gandolfo Allied troops who had escaped from the Germans and who worked also to bring Jews to Italy from occupied countries and into the safety of the many Vatican properties in Rome. He narrates the perilous work of Catholic religious such as the Sisters of Sion who hid thousands of Jews both before the German roundup of Jews and especially afterward. He notes the role played by Vatican Radio in exposing the anti-Semitic actions of the Nazis — broadcast content that the pope would have had to approve. This in itself belies the false charge that Pius XII was “silent” about the fate of the Jews. This is a rich, complex story, and one filled with ambiguities, from which the author does not shirk, of “what ifs” and “it could have been more effective if.” In general Thomas concludes that the activities of church personnel, much with the direct knowledge of the pope. Thomas often uses the phrase “the pope ordered” when referring to the actions of Catholic authorities and religious to save Jews. Certainly these saving deeds were done with his knowledge and approval, though not necessarily at his “order.” Indeed, many would not have needed “orders” to save Jews. My one major criticism is of his scant, less than two-page summary of the treatment of Jews by the bishops of Rome over the centuries. That treatment, in the main, was far more positive and protective of Jews, often in times in which they were persecuted elsewhere, than Thomas describes. This overall relatively consistent positive treatment of the Jews explains much in terms of Pope Pius desire to help the Jews, on the one hand, and the sense on the part of the Jews that the pope would (and could) defend them as popes had in the past on the other. Fisher is distinguished professor of Catholic-Jewish studies at St. Leo University in Florida.